Positive: Nice performance; comfortable keyboard; great built quality; decent hardware. Positive: High performance; solid workmanship; decent speakers; good ergonomy; comfortable keyboard. Negative: Poor display. Positive: Impressive design; excellent display; powerful hardware; high gaming performance. Negative: High price. Model: Usually the Lenovo branding is synonymous with the Think lineup of business notebooks from the bygone days of IBM when it was first produced. 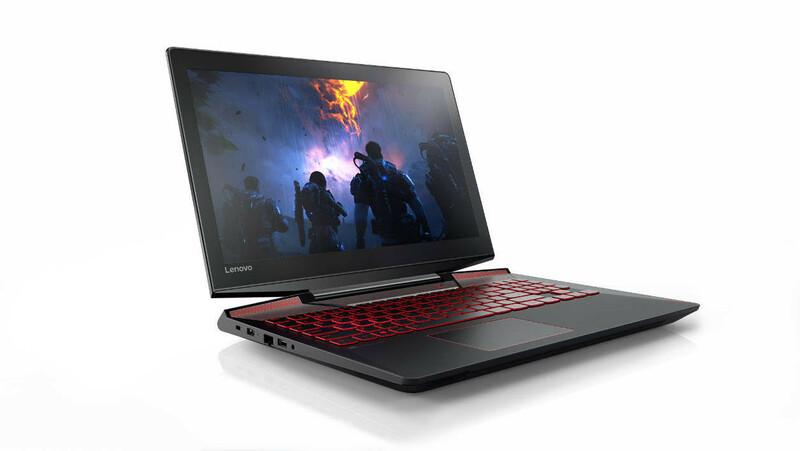 However, Lenovo has recently tried to penetrate the consumer gaming notebook market with its Y series. The prelude to this is the design Lenovo has decided to go with. It is a sleek business-esque design of Lenovo's Thinkpad series of notebooks which retains the gamery feel and look of most notebooks of its class. In terms of chassis and material the Legion Y920 is mainly a mix of both plastic and metal. Lid and undercarriage are made out of brushed aluminium, in which most of us have gotten used to. This allows the notebook to maintain a reasonable amount of rigidity without being too heavy due to its large size of 17-inch. Overall the chassis is well constructed with no flex. Naturally all this means nothing if it isn’t packing power. The Legion Y920 is powered by an Intel Core i7-7820HK processor with 48 GB of RAM, which is whoppingly plentiful by all regards, a 1 TB SSD, an additional 1 TB hard disk for storage, and last but not least the Nvidia Geforce GTX 1070, which provides the needed graphics horsepower to run games if not media creation software. While Nvidia has recently touted the Max-Q design for even slimmer gaming notebooks, it seems that Lenovo has not decided to go down that route. It is a 17-inch model, which means it straddles in between being somewhat portable and still powerful enough to deliver without compromising. However, it should be noted that a notebook of a similar class in the 15.6-inch category can already deliver this performance without adding unnecessary weight. Regarding connectivity, the Legion 920 has 4 USB 3 ports, 1 USB type C Thunderbolt port, a single HDMI and lastly a full sized DisplayPort. While the IO is certainly impressive it is somewhat lackluster for its size in view of the fact that some competitors are actually offer 2 instead of only one USB-C port and even more so for a notebook of this size. This is not to say it is bad but just somewhat stingy on Lenovo’s end. Regardless, it is still better than not having any USB type C ports. Going over to user inputs Lenovo has actually made a point to differentiate itself from its competitors by providing a mechanical based keyboard and a low profile version, which reduces its thickness significantly when compared to what MSI or even Gigabyte are offering in similarly sized notebooks. According to Lenovo the included low profile mechanical switches are of the Cherry MX designs although this leaves a little bit of skepticism as Cherry MX doesn’t have a low profile mechanical switch for its normal lineup of keyboard. Perhaps this is a custom design made specifically for the Legion Y920. The typing experience is somewhat indifferent as the keys feel a little hard to push and as if one has to bottom out the keys to actually register an input, which is definitely different from your standard mechanical switches. Nonetheless, users can type reasonably fast due to the nature of mechanical switches in general. Obviously, as this is still a mechanical switch, typing can be a little noisy, but at the end of the day it won’t leave you frustrated when compared to a membrane keyboard. In addition to the standard keyboard layout the Legion Y920 also has four customizable macro keys. Although it should be a given, it should be mentioned that the keyboard is also RGB backlit enabled with customization done through the Lenovo Sense app. Next in line would be the clickpad. While it feels nice to glide on the quality feels a little plasticky. It is also reasonably smooth and clicks provide a good amount of feedback. As with most gaming notebooks, it is the display that makes or breaks the experience. In this case, it somewhat straddles in between both. The included 17.3-inch IPS panel is only FHD. This should still be usable, although this leaves 4K a little more desired on a notebook of this size. The display features a 75 Hz refresh rate and is G-Sync certified, which makes it a great pairing with the Geforce graphics card. One significant gripe is the anti-glare finish of the display, which is a little too reflective when used in a bright room setting. However, this this shouldn’t be a significant issue. 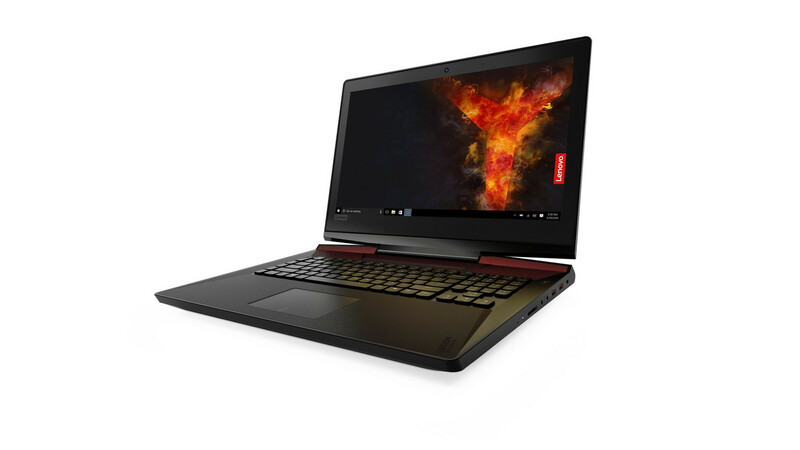 While not necessary for a notebook of this class, battery life is about where users should expect it with the Legion Y920 clocking in at 3 hours 40 minutes on Wi-Fi and 1 hour 40 minutes when gaming. If you are looking for a gaming notebook which doesn’t put out too much flair, but still delivers the expected performance the Legion Y920 might be worthwhile consideration.